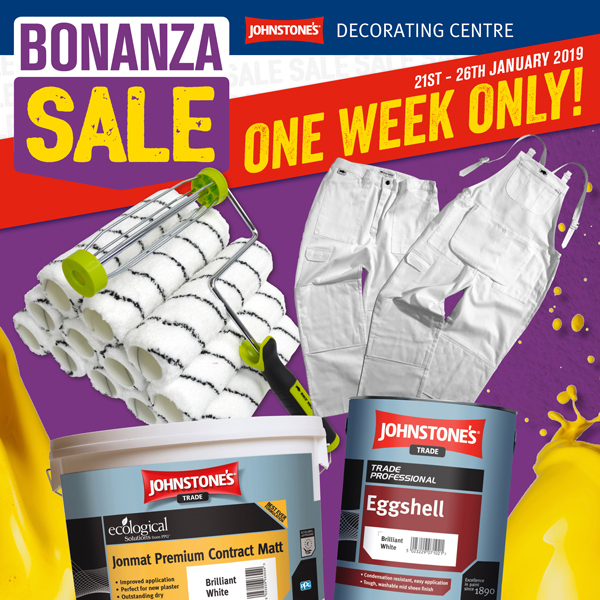 It’s almost time for Johnstone’s Decorating Centres’ first Bonanza Sale of 2019, which means painters and decorators up and down the country can start the new year right with a whole host of exclusive bargains. Launching on Monday 21st January, the spectacular six-day sale will offer unmissable savings on a range of trade favourites and brand-new products, available only in Johnstone’s Decorating Centres. Throughout the week, decorators can get massive savings on high-quality Johnstone’s Trade products, including 10L Jonmat Premium Contract Matt, which has been dropped to just £13.99 – a sizzling deal to warm a wintery January! The 13-piece Fat Hog 9” Microfibre Roller and Frame Kit is on offer for just £12 – that’s just £1 per roller and a free roller arm! That’s not all – with 40% off Fat Hog Decorator’s Trousers and Bibs and Braces, decorators can’t afford to miss out. A mammoth £340 saving on spray machines! For more details on all the offers, or to find a local Johnstone’s Decorating Centre or visit: www.paint247.co.uk. The Bonanza sale must end on Saturday 26th January 2019.